Mt. Hira College was established in the year 2000 and is a co-educational Foundation to Year Twelve Islamic College, located in Keysborough. 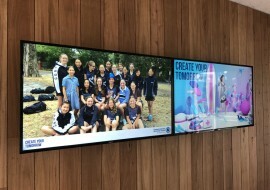 The school, having recently completed the development of a new two-storey VCE and Science Building, enlisted the services of Vision One to supply and install a number of interactive and presentation projection systems inside the new facility. In the 8x new classrooms, we installed Epson EB-696Ui Full HD Interactive Projection Systems above custom-built whiteboards. These new projectors offer ultimate interactivity by combining finger-touch with dual pen capability. 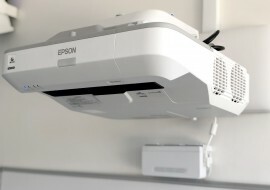 With a brightness level of 3,800 lumens and Full HD WUXGA resolution, the EB-696Ui’s ultra-short-throw design allows users to present large images from a very short distance with minimised shadows and glare while a 16,000:1 contrast ratio and HDMI input means that students benefit from sharp, clear images. In each space, we installed inDESIGN 30w Powered Speakers on either side of the whiteboard, JED T440 Wall Controllers for system control and dual HDMI/USB Wall Plates for connectivity. 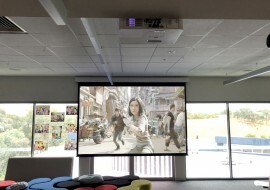 In the Lecture Theatre, we installed a Hitachi CPWX5505 WXGA 5,200 ANSI Lumens Projector to a Ceiling Post, throwing large-scale images to a 150″ Grandview Motorised Smart Projection Screen. A JED T440 Projector Keypad Controller was installed for system operation. We fitted the Theatre with 2x Audac AXIX Column Speakers and a BASO10 Subwoofer, spanning the width of the room. This hardware was powered via an EPA254 Amplifier and an AMC+MIX 4 Channel Mixer.